Specially developed for ships or boats with a length of up to 10 m. The battery voltage is 12 Volt. Thus this model can be used in almost any ship. With its thrust capacity of at least 50 kg, the CP 50 can be installed in vessels of up to 14 m long. If the CP 50 is to be used in a 12 Volt installation, a series-parallel connection can be delivered. 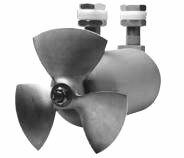 For ships of up to 18 m a rigid and reliable bow propeller with a thrust of 90 kg is available. Even when installing a CP 90, there is no extra loss of space in the bow of the ship. Since the CP 90 derives from the CP 40/50, all the advantages in these models are also present in the CP 90. Simple and quick mounting (no space is lost since motor is mounted inside tunnel). Ease of operation and maintenance free. Low noise and efficient operation (no chain transmission or other mechanical gear). Longer operation possible (motor is cooled by outside water).